Statistically riders who have taken advanced training are less likely to be involved in an accident. Advanced riding doesn't just mean being safer. We can show you how to get more from your riding, more from your motorcycle and how to make better progress without compromising your safety. If you ve biked before but are nervous about getting back into it we can tailor a course specifically to you. We base our courses on your previous experience and what you are looking for from your future biking. CBT is a great way to find out if biking is suited to you and its good fun too. If you are 16 and are fed up with using 'mums taxi' to get you around a CBT lets you ride a moped and could give you the freedom you are looking for. This can be taken on a machine between 115 and 125cc. If you are aged between 17 and 19 this will be your only option. Upon passing the A1 you will get a full licence to ride on the motorways and take pillion passengers, but you will NEVER be able to ride anything bigger than a 125cc machine that produces a maximum of 11Kwh (14.6 Bhp) until you pass the next (A2) when you reach a minimum age of 19 or two years after passing you A1 test. This will be taken on a machine of a minimum of 395cc that produces a maximum of 35 Kwh (46.6 Bhp). This can only be taken when you are at least 19 years old or two years after passing your A1. Upon passing you can ride any size of motorbike but the power is capped at 35Kwh (46.6 Bhp) this will never increase! The other "restriction" on the category, is the machine cannot be restricted to 35 Kwh if it produces more than 70 Kwh or 93.5 Bhp in standard trim. The Direct Access Scheme will still be available but the minimum age will rise from 21 to 24. The bike engine size of at least 595cc and must produce at least 40 Kwh (54 Bhp). You must be at least 24years old or can be taken two years after passing your A2. It is possible to obtain your A Licence at 21, ONLY IF you have already passed your A2 licence at 19. All Rights Reserved. 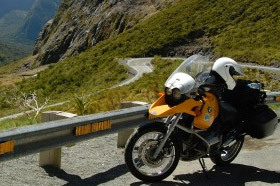 PRT Motorcycle Training provides CBT (Compulsary Basic Training) and Direct Access Motorbike Training and Certification.